Make sure the ginseng supplement you take passed our tests and is right for you! Ginseng may be helpful in treating diabetes, preventing colds and flus, reducing cancer-related fatigue, and in other conditions. But ConsumerLab.com has found problems with many ginseng supplements over the years. In this newest Review of Ginseng Supplements, 25% of ginseng supplements selected for testing contained less ginseng than expected from their labels. One ginseng supplement had only 59.4% of its claimed amount of ginsenosides -- key ginseng compounds. Six ginseng products passed the testing, along with seven products tested through ConsumerLab.com's Quality Certification program. The Review focused on Asian ginseng (Panax ginseng) (also called Korean or Chinese ginseng) and American ginseng (Panax quinquefolius). 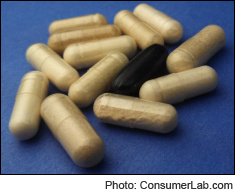 ConsumerLab.com found a wide variation in the amount of ginsenosides provided by ginseng supplements. Suggested daily servings yielded anywhere from 11.5 mg to as much as 72 mg of ginsenosides, indicating that the products might differ in their effects. One product was found to be of much lower strength than in the past, although the labeled ingredients remain the same.